When I was 14, my dad was hit head-on by a drunk driver. We were so very lucky; my dad survived the horrific crash. He suffered broken ribs, a cracked knee and a brain injury. At 14, I didn’t fully understand the complexity of brain injuries. I didn’t realise how big of an impact this injury would have on my dad’s life, my mother’s life and the lives of me and my siblings. Healing was a long road for my dad, as it is with anyone who has suffered a traumatic injury. To look at my dad, his injuries only took a few weeks to improve; his Klingon-like forehead, black eyes and swelling subsided. But he struggled with memory, especially short-term memory, recall and persistent, intense headaches. As a bratty, spoiled, naive teenager, all I saw was that this man was so unlike the father I knew. He’d developed a temper, he angered quickly, and he struggled to remember the words for things, the names of my friends and memories of my and my brothers’ childhoods. I wasn’t sympathetic to what he was going through, at the time all I saw was that this was not my beloved dad, and I was angry. We’d had a basketball hoop in our driveway for as long as I remember. My brothers and I spent a lot of time out in that driveway with that hoop. My parents would park their car at the very bottom of the driveway and my brothers and I would play for hours. We’d play two-on-two, or our own strange variation of horse. We’d practice crazy moves and jumpshots. Sometimes our friends would join us. But it was the one thing my brothers and I could all agree on and play together, despite our age differences and skill level. The spring after my dad’s accident, some nights my siblings and I would just stand around in silence, practicing our shots. I remember one evening, where we were playing in the driveway and my dad came out on to the porch and watched us play for a bit. My youngest brother tossed my dad the ball and, out of habit, my dad took a shot from his spot on the porch. He made it. I remember my dad smiling and laughing in ways he hadn’t in a very long time. I remember feeling my whole being relax; there was my dad. He hadn’t left us. He was still here. There was hope that things would be okay. Basketball became a central part of my family’s healing. 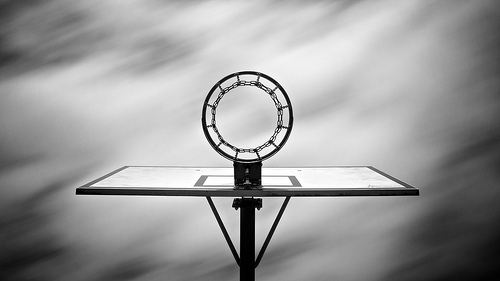 We shot baskets in the driveway, it gave us the opportunity to put aside everything that was going on and play. My dad became the coach of my brothers’ basketball team. My mum and I spent many Saturday afternoons at various rec centre gyms, cheering on their team. We’d spend time in the driveway, practicing techniques. Around the dinner table, we would talk strategy, rules and stats.We would go to games at the Air Canada Centre, sitting so high up that it felt like we could touch the roof of the arena and we would cheer on the Raptors, loving the energy and excitement around what had become our family’s favourite sport. None of us ever grew up to be basketball stars, but the game gave us a way to be together, to play, to enjoy a sport, to learn about teamwork and gave us a place to work through our big feelings. And that is how my love for this sport grew.